Field Forensics has launched a lightweight thin-layer chromatography (TLC) kit that can be used to screen medicines for authenticity and quality in the field. The new product – called the microTLC - can be used to detect counterfeit and substandard drug compounds, including many that are commonly targeted by pharma criminals such as anti-infective and anti-parasitic drugs as well as other essential medicines. “TLC is an established laboratory procedure that identifies compounds belonging to the same general chemical class,” said Field Forensics in a statement. 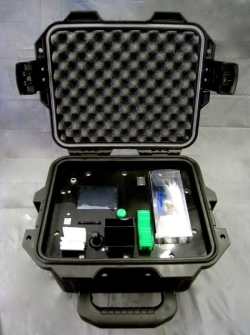 Field Forensics has made strenuous efforts to make the kit (pictured) as small as possible, for example by using only one TLC plate. It also features an integrated ultraviolet light source and a digital video camera for plate analysis and record management. It uses commercially available plates as the separation medium and a colorimetric identification scheme that provides confirmation of the identity of the analyte under analysis. Pre-spotted plates can be used with standard drug materials to compare with field samples. Total analysis times for a drug sample can be less than three minutes including sample preparation, according to the company, while the limits of detectability are typically at nanogram levels and in some cases picogram levels are possible.